Most of us may hope never to be in prison, but as long as we tolerate prisons that cage human beings under conditions that would be illegal for animals in a zoo, we lend our acquiescence to the idea that it is permissible to treat human beings inhumanely. If we tolerate discrimination against women, or racial minorities, or the handicapped, we give our consent to injustice. If we accept that anyone may be denied their rights, their freedom, then we undermine our own rights and freedoms even as we undermine social solidarity. He who would do good to another must do it in Minute Particulars. General Good is the plea of the scoundrel, hypocrite, and flatterer. 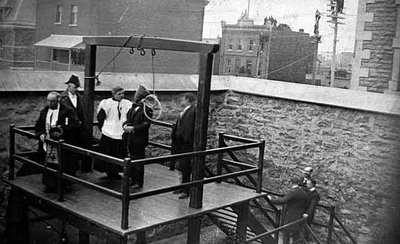 Ten years before that, in December 1952, the Don was the site of another double hanging when Jackson and Suchan went to the gallows at midnight while outside, waiting for news of the murderers' death, a drunken crowd milled about, celebrating and providing living proof of the uplifting effect which the death penalty has on society. The deliberate legally sanctioned taking of a human life is a potent emotional totem, an act through which we participate symbolically in the forbidden act of killing. No wonder then that the "debate" over capital punishment is so emotional, so categorical, so barren of analysis of whether the death penalty actually makes practical sense. In fact, the most policemen ever killed in Canada in one year -- 11 -- died in 1962, when the death penalty was last carried out. The following year, with the noose put away, not a single policeman was killed. Hardly an indication that Canada is full of potential police killers held in check by the death penalty alone. What does have a discernible effect, on the murder rate, on other crimes of violence, and on the crime rate in general, are various social factors. Every percentage rise in unemployment, for example, is accompanied by a corresponding rise in mental illness, suicide, and crimes such as wife beating, child abuse, robbery - and murder. This is not to say that being unemployed or poor directly causes people to become criminals - most unemployed people are no more likely to commit a crime than their employed counterparts. But it is to say that being unemployed with little hope of getting a job puts a serious strain on people. If they are young, male, and given to hanging around - what else is there to do? - that strain may well be compounded by regular harassment from police, who at times seem determined to turn such youths into police haters. Most cope with the strains of poverty and unemployment in ways that do not bring them to the attention of the police. But inevitably some do not. 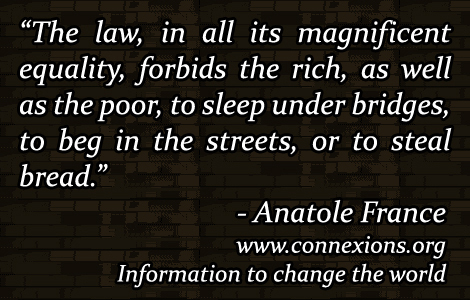 And inevitably, as the number of the poor and the unemployed increases, so does the prison population. Society can't afford the small amounts required to help people become decently self-sustaining, but can afford to spend the far greater amounts required to keep people in jail. Canada stands out among Western countries for keeping more of its population in jail despite a lower crime rate. What is more horrifying, in a sense is the picture of a society cold-bloodedly organizing itself to kill. Deciding that killing people is a way to solve problems, and setting up a machinery to do so. Paying jurors and judges, carpenters and electricians, doctors and priests, and hangmen, all to take part in a planned and deliberate taking of human life. Paying them for their participation. All in a day's work. This kind of cold blooded killing is the most horrifying of all. Especially when alternatives are available, and we refuse to take them. * "Our neighbourhood" refers to the area of Toronto east of the downtown where the Don Jail is located. Published in Seven News, November 1984. Also available in Chinese. Also available in Korean.